"A delicious and healthy side dish for the summer when you have lots of greens to use!" Heat oil in a Dutch oven or heavy pot over medium heat; cook and stir onion until softened and beginning to brown, 10 to 15 minutes. Add garlic to onion; cook and stir until fragrant, about 1 minute. Stir kale and water into onion mixture. Cover Dutch oven and cook until kale is tender, about 30 minutes; season with salt and pepper. 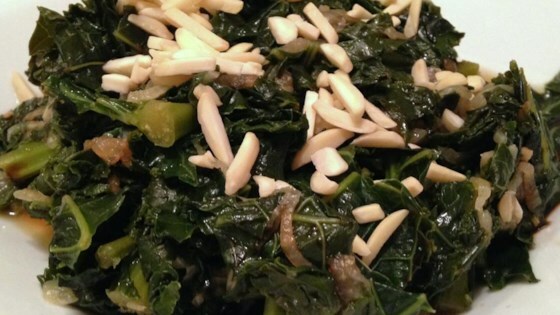 Drizzle balsamic vinegar over kale and caramelized onions and sprinkle almonds over the top. Try to use a quality balsamic vinegar if you have it available. made this recipe for the first time tonight. very tasty and healthy too! I used a whole onion, 1/4 cup olive oil and no balsamic vinegar or almonds. It was tasty, easy to digest and I'll make it again. One of my favorite kale recipies. We make it once a week.